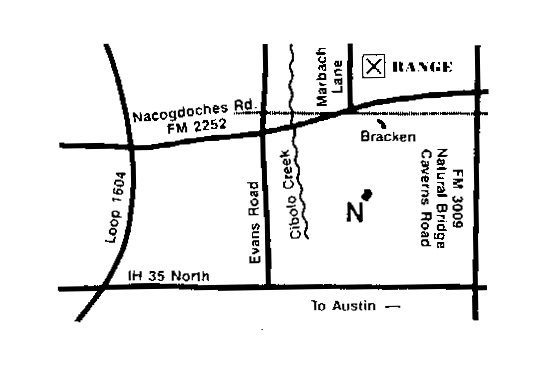 To reach Bracken Range, take Loop 1604 North to Nacogdoches Road (Rolling Oaks Mall). Turn North (outside the Loop) on Nacogdoches Road. Go exactly two miles (until you reach the small community of Bracken). You will cross the Cibelo Creek and a set of railroad tracks. Turn left on the second road past the railroad tracks (about 200 yrds past the tracks). The name of the road is Marbach Lane. Bracken Range is 1/2 mile down Marbach Lane on the right.